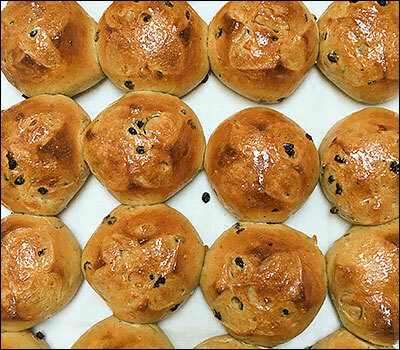 We will have Hot Cross Buns available at the Still-Room on Good Friday, April 19th after 9.00 am and at the Ferry Plaza Farmers' Market on Saturday, April 20th. We are making 90 buns for each day. To guarantee availability please pre-order by contacting us at june@junetaylorjams.com. Payment in advance is required. We work with organic ingredients and do not use commercially grown or produced ingredients. Ingredients: Locally grown (by Capay Milling) wheat flour, all purpose white flour, sweet butter, brown sugar, eggs, whole fat milk, currants, candied citrus peels, salt, spices, citrus zest. $4.50 each or 12 for $50.